What is “Screaming On The Inside” about? Screaming on the Inside is a burning anthem about pressing through the emotional damage which is so often inflicted in life. Your heart will break—and soar—through these very personal and powerful stories of injury, devastation, and restoration. Read how one woman pushed beyond fear and pain to find the joy and peace of total acceptance in Jesus. And, the real message of the book is: you can do this too! 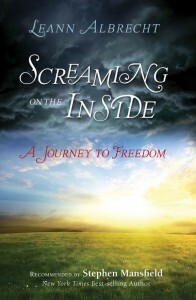 Screaming on the Inside gives towering encouragement to the millions who need to take the first step toward wholeness. “It is one thing to read a book by someone you do not know and yet who has suffered for the beauty on the page. It is quite another to watch a friend hurt and weep and reach for God in heartache and then to read in astonishment the inner glory wrung from her life. This is how I feel about Leann Albrecht’s writing. and public speaker. Her voice can be heard on hundreds of recordings and she appears at events around the world. Screaming on the Inside is Leann’s first book. She and her husband, Carl, live near Nashville, Tennessee. Thanks, Lisa. You can order my book online and my office will ship it out to you quickly. I hope you find great personal freedom as you read the pages. Over the past few days my mind has been focussed on the times we ask in faith and believe our prayers have not been answered. Then we get discouraged. As a lay missionary, I prayed to the Lord for some clarification on how to answer people who tell me how disillusiuoned they are in such situations when it is believed that God never hears or answers. Of course, that is what satan wants us to believe – but it is totally incorrect. The Lord spoke to me very clearly that Leann Albrecht’s book will satisfy such questioning and while I have not (yet) read the book, I am so sure that the word I received was from God that I felt without any hesitation I should make it known. Wow…David thank you for your post of affirmation. I wholeheartedly agree with you. This book answers a lot of questions about life. I wish there had been a book written like this when I was a young person. Thank you, Holy Spirit, for speaking through David. I am ordering the book right now as I believe, from the Word I received from the Lord, that it constitutes a cast iron guarantee for every frustrated, unhappy, dissatisfied, broken unfulfilled person. All one has to do is to claim that guarantee and it will be ones very own.